Learn how to create a the Google Maps API key that you need for a geolocation auto-complete field for Caldera Forms add-on. 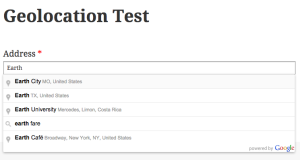 The Geolocation Field for Caldera Forms provides an easy way to turn any text field into a geolocation auto-complete field. This tutorial shows you how easy it is to set up the field and a few ways to use that data.